John Hodges Williams was baptised on 31st October 1852. He was the eldest son of John Williams, a tailor and his wife, Emma who lived in Gloucester House, (later to be known as 2 Gloucester Road). In March quarter 1871, John married Julia Harriett Barrett in the Clifton area of Bristol. Julia was the daughter of Henry Barrett, a draper and his wife, Harriett. In 1861 the Barrett family had been living in Victoria House, Highworth in Wiltshire. However we know that the family moved to Thornbury because Henry is listed in the 1867, 1869 and 1871 Rate Books as living in the house/shop which became known as 5 High Street. We are lucky to have an old photo of the street showing the Barrett shop there. The 1871 census shows that the Barretts had moved away and John and Julia had moved into their house/shop and this is confirmed by the 1876 Rate Book when the house and shop were owned by John’s father, John Williams. In the 1871 census John was a draper aged 18. Julia was aged 21 from Highworth in Wiltshire. Julia’s brother, Arthur E Barrett aged 6 was living with them as well as a draper’s assistant, Alice Rock and a servant, Clara Hopkins. John and Julia had three sons; John Henry Williams born on 13th July 1871, Henry William Williams who was born in 1872 and Frederick George Williams who was born in 1874. The 1876 Rate Book shows John (Jnr) seemed to be the owner of number 1 High Street, a premises occupied by Robert Phelps, a barber and grocer. The 1880 Rate Book shows John was still living 5 High Street, and that he had expanded his ownership to include that property and another just below the Police Station occupied by Harriett Mawley. The 1881 census shows John was a draper and he was living in his property in the High Street with Julia and their two children: Henry W aged 8 and Frederick G aged 6. They had a draper, Arthur E Barrett (brother-in-law) and a draper’s assistant, Rosa E King, sharing the house with the family and a servant, Louisa Watkins. John and Julia’s eldest son, John Henry, was listed with Julia’s parents in Weston Super Mare where Henry Barrett was a haberdasher. The 1890 Rate Book shows John had taken over a couple more properties including 1 and 4 The Plain and another one just up from the place where he was living. The 1891 census shows John’s property at 5 High Street was called ‘Victoria House‘ the same name that Julia’s father had used for his shop in Highworth. In this census, it was just John and Julia living there with two boarders who assisted John in the draper’s shop and a general domestic servant. Following the death of his parents, both in 1897, their estate was passed to John. Although he took over his father’s tailoring business in Gloucester House he arranged for his son, John Henry to run this business for him and paid him a salary for the work he undertook. In 1899 John was appointed Mayor of Thornbury. 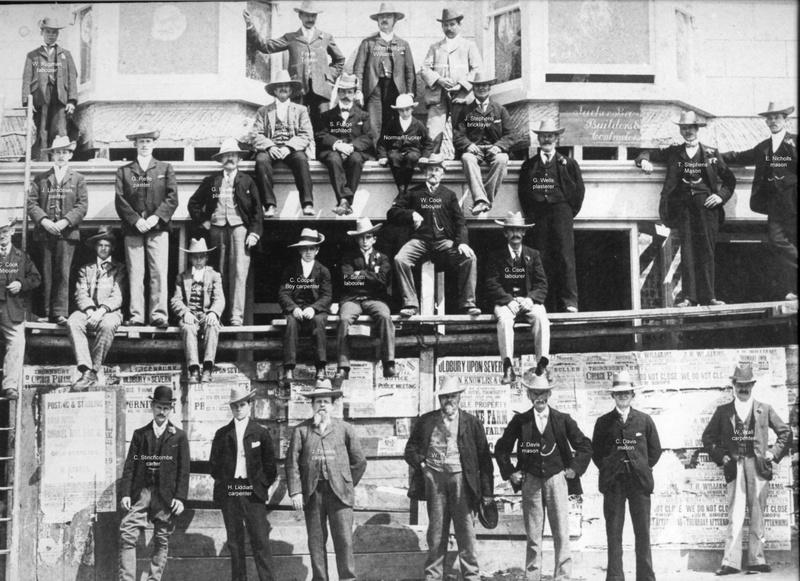 The image of John at the top of this page was taken from a photograph of Tucker Brothers workforce in 1902 when they were working on the refurbishment of John’s property, Coronation House at 13 High Street. Click on the thumbnail on the right to see the full image with names. The 1901 census shows John still trading as a draper in Victoria House and sharing it with Julia and one assistant and a servant. However, in 1902 John’s tenant of 1 The Plain, James Spencer Palmer, moved to another of John’s properties, a larger newly built premises further up the High Street called Coronation House. John took the opportunity to open another shop at 1 The Plain. This one he called ‘Bon Marche‘ and it became an outfitters. The trade directories of that period show that John operated from both premises. He is listed as ‘a silk mercer, linen draper, family mourning and funerals furnished, and collector of income tax’. It shows him as operating from Victoria House in the High Street and Bon Marche at 1 The Plain. In 1902, the words “& house furnisher, The Stores, and glass & earthen ware, The Beehive” were added to his list of interests. This is somewhat confusing as it suggests that John may have had three or four separate outlets in Thornbury. The Beehive was at 7 High Street. We suspect that The Stores was the name of John’s shop at 33 High Street, but we have no information to confirm this. John carried on investing in property. The 1899 Rate Book shows he owned the two houses on The Plain, numbers 1 and 4, six properties between the corner of the High Street and The Swan Hotel and he was now occupying two of these for his own purposes, another above the Swan occupied by Francis Williams, and another two houses in the High Street (now known as 62 and 64 High Street) and two in St Mary Street, one in Raglan Castle Road (16 Upper Bath Road), one in Bulls Eye Lane (5 Bath Road) and five houses in Gloucester Road, plus additional plots of land etc. The 1905 shows further expansion including three houses in Silver Street and two at the top of the High Street. The 1910 Rate Book shows another four houses at the top of the High Street were added to the property portfolio. However it is noted that John seems to have ceased trading from Victoria House and was concentrating his trading within Bon Marche on The Plain. We have assumed that prior to 1910 John and Julia had lived in Victoria House above the shop, but we know that in 1910 they had moved to a newly erected house in Pullins Green (later to be known as 1 Pullins Green). This was owned by a cousin of John’s, James Albert Hodges. The 1911 census shows that they called this house “Clovelly”. It indicates that John and Julia had been married for 41 years and that one of their three children had died. John is shown as being the tenant of the property when the house was put up for sale in 1912. We are not sure where John and Julia lived after 1912. The electoral registers show that they were living in the High Street. When Julia died on 10th August 1930 aged 80 her address was shown as The Plain. We suspect therefore that they were still living at 1 The Plain, which is on the corner of The Plain and the High Street. John died on 11th May 1934 aged 81. His probate record shows that his estate was valued at £7,200 13s 11d. John’s obituary appears in the Dursley Gazette May 19th 1934: “With the sudden death on Friday of Mr John Hodges Williams of The Plain, Thornbury, another connection with the past has been severed, for at the age of 81 years Mr Williams was Thornbury’s oldest tradesman and he had carried on business in the town for 54 years. Mr Williams was at the time of his death a large property owner in Thornbury, and the immediate district but he was fond of telling how he began with nothing and of the early struggles he had before he prospered. A good many years ago Mr Williams was elected Mayor of Thornbury but for many years he had taken no active part in local government affairs. However he took a great interest in all that appertained to the welfare of the town and only about three months ago he gave to the district council a site for the proposed public convenience for Thornbury.” This public convenience stands at the bottom of St Mary street opposite The Plough Inn and is still in use today”. Frederick George Williams – we don’t know much about him. In the 1901 census he was a draper’s assistant in Oxford. The announcement of his wedding to Jeanette Elizabeth Pearce of Spes Bona Lodge Oddington appeared on August 20th 1902 at which time he was described as Frederick George Williams of Berkeley.